Of course, Cleopatra is a notoriously difficult part, an Everest for any actress to climb. She has to be able to turn on a sixpence from one emotion to another, from coquetry to vindictiveness, joy to anguish, and to hold enough back for the final Act to make credible the most flamboyant death-scene in all Shakespeare. There’s no record of the play’s performance in the Bard’s lifetime. For a young boy in The King’s Men, the role must have seemed even more daunting than it does for the modern thespian. Perhaps Shakespeare was writing for a theatre of the future? As Cleopatra, Miss Helen Mirren was well equipped physically for the part with a voluptuous, sensuous figure that swayed with such conviction that rehearsals must have made considerable disciplinary demands upon the rest of the company. I can well imagine them being tempted to break out into storms of appreciative whistles. In her taunting, kittenish treatment of Antony, Miss Mirren pouted and sighed to good effect, but there was little here of the regal eroticism that made Cleopatra a symbol of feminine mystery and power. Her death scene, too, seemed a very small affair. Mark Antony and his Cleopatra were, very simply, two or three times as good as I had hoped. If we did not look for supreme excitement, we did find a reliance on Shakespeare, an unrestrained honesty. 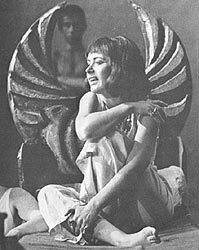 It touched the imagination when… the young Cleopatra, who at first had seemed to be from Shaw’s play rather than Shakespeare’s, sat robed and crowned, awaiting the ecstasy of death. Miss Mirren is continuously exciting both to watch and to hear. If majesty comes to her aid only at the close of the play, it does so after she has displayed all the other dangerous attractiveness that Shakespeare demands. There is plenty of intelligence. 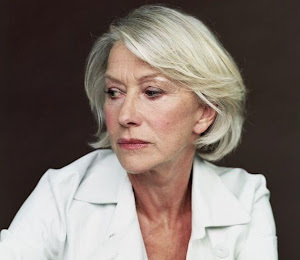 There just is not enough age… No one believes John Nightingale and Helen Mirren when they talk about grey hairs. Both act bravely, sometimes better. But Shakespeare’s sensuality is far out of their reach. So is his tragic climax; Cleopatra’s asp gets out of hand. a wintry, embarrassed man who allows one to forget for once that the people on the stage are quite simply too young to have experienced the feelings of the play. By professional standards it doesn’t work by miles, and it is a meaningless piece of piety to pretend anything else. English Cleopatras, from all accounts, nearly always disappoint – they may excel at coquettish repartee or in swift changes of mood, they rise to moments of majesty and shine briefly in the death scene, but they don’t much relish the actual tumbling on the bed of Ptolemy… All the more startling, then, to find a Cleopatra who, with all the usual graces, is riggish to her fingertips. Helen Mirren’s Cleopatra is unselfconsciously and immoderately sensual. Here we seem to have an actress potentially quite outside the English tradition, at any rate since the heyday of Mrs Barry and Mrs Bracegirdle in the eighteenth century. At the end of the week the state ought to have been there, pressing forward with its cheque-book to offer her the finest training that money can buy. She is borne in on a litter to while away the hours of Antony’s absence and, as she stretches luxuriously and caresses her own soft flesh, we feel more strongly than if he were there her invocation of his physical presence. The question Curry doesn’t ask, and I rather wish he had, is how far Mirren’s view of the character has changed over forty years. This political manipulator that she describes now, for whom ‘everything is either a performance or a calculation of some sort’, is this the ‘same’ character she was essaying as a bold 20-year-old? In the recent interview she seems to be a bit cross with Shakespeare for not creating the character she wants to play. ‘I was always looking for ways to bring the real person into this rather fake person that Shakespeare presents,’ she declares. Be careful, Helen – that way arrogance lies. *Spurling, later to make a solid reputation as a biographer, was only 24 herself at the time and, by her own admission, ‘the most dreadful, scathing, swingeing, destructive critic, a battleaxe’. 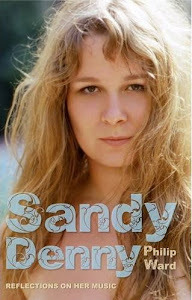 In the late Sixties, Lindsay Anderson, joint artistic director of the Royal Court, tried to ban her from his theatre, having taken against one of her notices. But in this review she seems to be (as they say) ‘bang on the money’.